In what was a serious case of moonlighting, a British police inspector has lost his day job, after being charged with selling drugs stolen from raids. In what was a serious case of moonlighting, a British police inspector has lost his day job, after being charged with dealing heroin, cocaine, ecstasy and cannabis stolen from raids. The police inspector, Keith Boots, was recently jailed for 26 years after being found guilty of running a million-dollar drug-dealing operation. He sold the heroin, cocaine, ecstasy and cannabis that he was actually in charge of destroying for authorities. But the 55-year-old Briton wasn’t working alone, as the former police inspector conspired with his son, Ashley Boots. 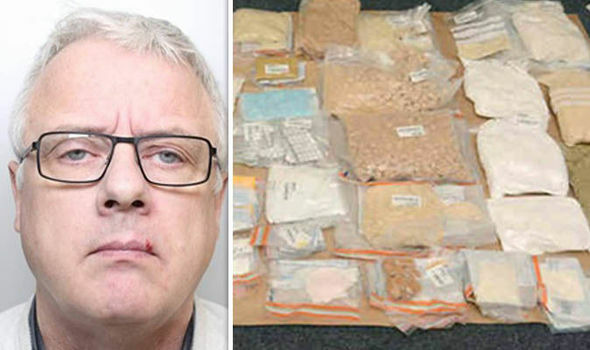 Instead of destroying the drugs, the then inspector stole the contraband from the evidence stores of the West Yorkshire Police, before he passed the drugs on to his 30-year-old son, who would organize the sales on the streets. The street value of the seized narcotics was valued at close to a million dollars, but investigators could not say exactly how much the Boots had sold before being caught. Although, sources have said the operation could have easily run into the millions. Along with hearing Boots being called a “disgrace to the uniform” by Judge Geoffrey Marson, the court also learned Boots had been in charge of supervising the destruction of the seized drugs at Trafalgar House police station. He would sign the drugs off as having been incinerated but instead quickly put them back on the streets with his son and the latter’s network of criminal contacts. It all came to an end when police raided the Boots’ property in December 2014, where drugs were found throughout the house, including the washing machine, fridge, and fireplace. After being found guilty of conspiracy to steal and supply drugs and conspiracy to pervert the course of justice, the former police inspector was given a 26-year sentence, while his son was jailed for 24 years, after being convicted of conspiracy charges and pleading guilty to possessing drugs with intent to supply. The younger Boots also admitted to illegal possession of ammunition without a firearms certificate, too. Despite being a family business, a third man was also found guilty of conspiring to pervert the course of justice, resulting in a five-year jail sentence.